Download your free copy instantly and sign up to receive updates from The Peaceful Runner Newsletter! Begin your journey to running injury free today! Discover 5 unconventional way of running injury free that you probably never heard of before. Every year 60-80 percent of runners become injured. You don't have to become a statistic. "Thanks for your wonderful book. I am reading it with great interest. 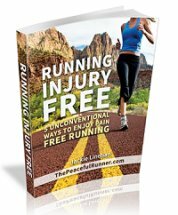 It is so informative and helpful for all runners!" Use this book to implement steps and strategies to greatly enhance your chances of never having another running injury. Let your journey to becoming an injury free runner begin right now! "Thank you so much for your book. It was very enlightening. Even when "running" helps us to be more in contact with ourselves and have more awareness of our body, sometimes we can get lost because we are very concerned about our "timing" or "training goals". I like that you offer exercises, ideas and tips on how these methods can be done. I will definitely apply them and include them in my program. I enjoyed the Running Mindfully part, and how running if it is taken it to another level (connection body + mind) can be similar and have the similar effects and results as a yoga class. I really enjoyed your book. I agree with your ideas and I definitely learned new ideas as well." The 100-Up Exercise is a simple drill discovered by Walter George in 1874 who set a number of world records in various distances. He discovered the exercise while working as an apprentice with very limited time to train. The drill is designed to both improve running form and speed. 17 Ways to Attract Abundance will inspire you as you learn how to attract abundance in whatever form you desire--health, fitness, peace, love, success, or prosperity. The classic by Robert K. Stevenson, N.D., Backwards Running. It shows you exactly how to incorporate the proper backwards running technique into your training. It explains how to use it to enhance your fitness and improve your mental strength and attitude for a more fulfilling life. The controversial Ebook, Running Fast and Injury Free by Gordon Pirie. His radical approach to running and training will inspire you to run and train better, while reducing the risk of injury. 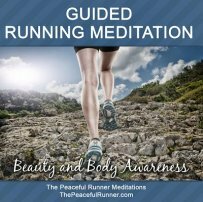 The Power of Meditation - "Discover The Power of Meditation And How It Can Work For You To Increase Your Success In Your Personal And Work Life..."
What's in The Peaceful Runner Newsletter? Each month we'll send you a new issue of our FREE newsletter. It will contain information and tips designed to help you run injury free. We want to help you become a happier, more peaceful injury free runner as you strengthen the mind and body connection and reap all its benefits -- both in running and in life! Each issue of The Peaceful Runner Newsletter includes an article to inspire you to run better and happier. You may also find information on our new products as they become available, other running related products or recommendations to help you discover and connect with your inner power and capabilities. Delivered free to your inbox each month! You can check out all previous issues of The Peaceful Runner Newsletter below. Subscribe now to get your free eBooks! Are you a Peaceful Runner? Find if you meet our qualifications and join the Peaceful Runner Club. It's free and you may win great prizes. #87 - December 2017 - Happy Holidays! #86 - November 2017 - Can Running Be A Spiritual Practice? #85 - October 2017 - Do You Have Runners Knee? #84 - September 2017 - Do You Suffer from IT Band Syndrome (ITBS)? #80 - May 2017 - Why do Affirmations Work for Some and Not for Others? #63 - December 2015 - Finishing At The Back-of-The-Pack! #62 - November 2015 - Why Do Runners Get Injured? #61 - October 2015 - Are You a Good Runner? #58 - July 2015 - Make Pain Your Friend! #57 - June 2015 - Do You Have Limiting Beliefs About Your Body? #56 - May 2015 - Do You Forefoot Strike While Walking? #55 - April 2015 - Do You Know ALL the Advantages of Barefoot Running? #54 - March 2015 - Can You Improve Running Performance By Dressing Too Warm? #49 - October 2014 - Do You Listen to Music While Running? #47 - August 2014 - Has Running Changed You? 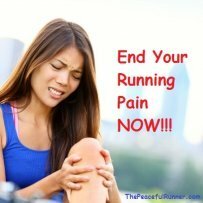 #46 - July 2014 - How Do You Deal With Running Pain? #45 - June 2014 - Is Running Solo Better? #41 - February 2014 - Enjoy Runner's High More Often! #40 - January 2014 - Can you Handle Cold Weather Running?